Model 405 (shown) has hand pump drum lift, and hand crank drum tilt control. 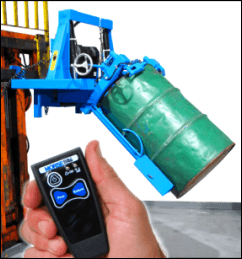 Load an upright drum into Omni-Lift Drum Racker. You can lift an upright or horizontal drum from the floor. Secure drum into holder of drum racker with web strap and ratchet. Raise the drum, and rotate into horizontal racking position. Once drum is horizontal, release the web strap and ratchet. The drum is now supported by the cradle, ready to be placed into a drum rack. Morse Omni-Lift Drum Rackers enable you to rack drums up to 72" (183 cm) high. They are easily handled by one person. Lift a drum from either horizontal or vertical position on the floor. 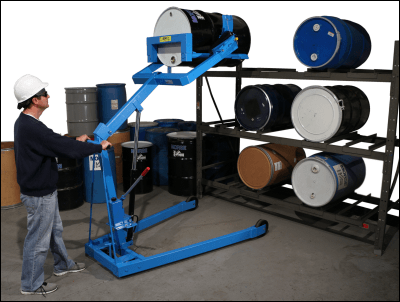 Please see the typical rack configuration served by the Omni-Lift Drum Rackers. Handle your drum with up to a 10" (25.4 cm) long drum faucet in place. This allows your drum rack to serve as a dispensing station. Ergonomic power lift and power tilt options available with your choice of Air, AC or DC motors. 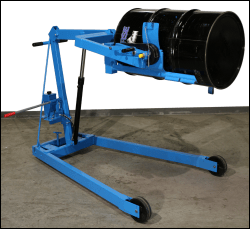 Move drum racker easily on two 8" (20.3 cm) front wheels and two 4" (10.2 cm) swivel casters under rear of frame. Handle 55-gallon (210 liter) STEEL drum. install Kit # 3313-P Plastic Drum Pads. 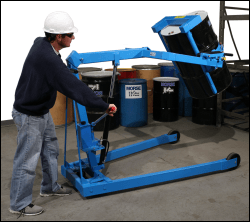 Omni-Lift Drum Rackers can also serve as a dumper with controlled pouring. The Omni-Lift Drum Racker will accommodate a drum faucet that extends up to 10" from the drum. 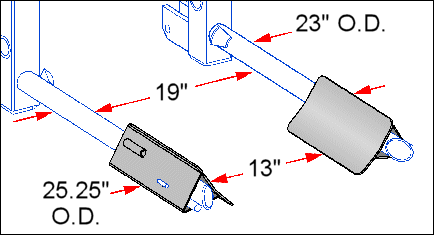 Models with spark resistant parts are also available (see chart below). They include spark resistant Poly Drum Pad Kit. 405 Manual-lift (hand pump) and manual-tilt (hand crank) 428 Lb. (195 kg) L72" W50" H55"
405-110 AC powered lift and tilt 493 Lb. (224 kg) L72" W50" H55"
405-114 Air powered lift and tilt (Air Motor Technical Info) 463 Lb. (210 kg) L72" W50" H55"
405-115 12V DC powered lift and tilt 522 Lb. (237 kg) L72" W50" H55"
405-120 AC powered lift with manual hand crank drum tilt 450 Lb. (205 kg) L72" W50" H55"
(Air Motor Technical Info) 451 Lb. 405-125 12V DC powered lift with manual hand crank drum tilt 530 Lb. ( 241 kg) L72" W50" H55"
for steel or plastic drum 428 Lb. for steel or plastic drum 463 Lb. spark resistant parts for steel or plastic drum 451 Lb. 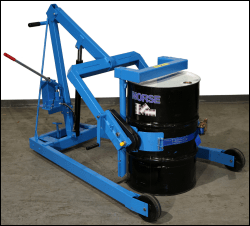 Install Kit # 3313-P Plastic Drum Pads to adapt your Omni-Lift Drum Racker for handling a 55-gallon (210 liter) plastic drum with top rim. The Drum Pads are designed to support a flexible plastic drum. 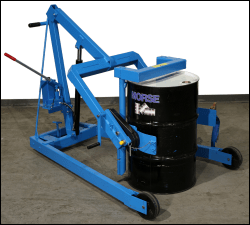 The Pad Kit allows you to handle a 55-gallon (210 liter) plastic drum with top rim, as well as a 55-gallon steel drum. This kit reduces maximum drum cradle width from 19" (48.3 cm) to 13" (33 cm) for racking a 55-gallon drum. NOTE: Pad Kit is NOT needed for models with spark resistant parts. 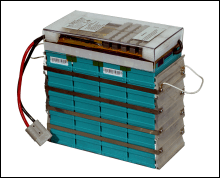 Spark resistant model numbers 405M, 405M-114, 405M-124 include spark resistant poly drum pads. 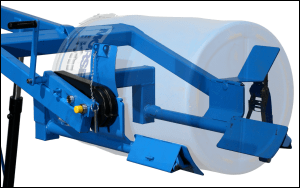 Half-full drum rating is an indication of capacity for tilting unbalanced, bottom-heavy drum. Partially full drum with unbalanced and shifting load is harder to tilt than full drum.